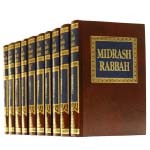 Midrash Rabbah: This edition is the definitive English rendering of the Midrash Rabbah, one of the monumental productions of rabbinic literature. The Midrash is the most striking testimony to the joy and reverence with which the Jews have cherished the Bible. Megillah: Illustrated Youth Edition By Rabbi Nosson Scherman Rabbi Meir Zlotowitz. For children of all ages - a megillah like none you've ever seen before! It is replete with brilliant illustrations, summaries across the tops of the pages, the full Hebrew text in easy-to-read type, a translation that is simple, yet accurate, and a selection of short commentaries. Illustrated by Michael Horen.